Sometimes I feel as if I’m a different person than that girl who walked down the aisle seven years ago. In a new-and-improved sort of way, mostly, so that’s good. =) Marriage has been a huge blessing in my life and I’m super thankful that I chose Jeremy, even though I had to wait to meet him until I was 29. But honestly, marriage has been full of surprises and I wasn’t expecting some of them at all. I thought wifehood would be sooo easy! 😉 I was totally planning on being the wife of Jeremy’s dreams without any extra effort on my part. Let’s just stop right there. Are you rolling your eyes yet? I kinda did and I wrote it. 😉 Now, I don’t want you to think that there are never those sweet moments – of course there are and they’re wonderful. I’m very happily married to my mister…but I will admit that during the early years, there were days where we weren’t so happily married. Gasp! I know. But I feel that it’s important to be honest with you. Back then, I vividly remember reading a blog post from someone I thought must have the happiest marriage ever…she admitted that sometimes they hurt each other’s feelings or made each other cry. They didn’t even agree on everything, always, like I had imagined. And a huge wave of relief washed over me. We were normal. There was hope for our imperfect marriage. So, I tell you today – our marriage, as good as it is now, had some rocky points. There’s hope for us all. Remember that. On to the real list. 😉 These are the things I want to share with couples approaching marriage. And couples disillusioned with marriage. And frankly, singles who aren’t even dating anyone seriously. Because this list is made up of things that you can start working on right now, whatever your marital status is. This is the list that I wish Single Kristen had focused on and prayed about before she became Wife Kristen. #1 The wedding day is not the most important day in your marriage. It almost seems like it really is. It’s incredibly deceiving. But choosing the perfect dress, the ideal venue, a gorgeous color scheme, and Pinterest-worthy vignettes, while enjoyable (at least for the bride) just won’t prepare you for being happily married. It’s really a case of the urgent overtaking what’s really important. You’ve got this wedding date scheduled and almost everything else in life gets put on hold while you tick items off your list in preparation for that particular day. The pressure’s ON. We even opted out of premarital counseling because we were so busy with wedding prep and two new jobs, but we should have made time. Not just to check off a little box, but to actually explore important topics as we established our family. At the very least, Google “premarital counseling questions” and work through them yourself as a couple. Spend time in prayer for your marriage together. If you don’t make these kinds of thoughtful preparations before you get married, there’s an excellent chance that there will be many hard, tearful conversations later. You don’t want that! Just realize that the marriage part is more important than the wedding part and act accordingly. #2 A marriage is the joining of two imperfect people. That was a hard pill to swallow. 😉 I liked to think of myself as closer to perfection than I really am. Marriage exposed that ugly untruth. And it was something I needed to know! I’m a sinful creature, but God is able to use this marriage relationship to refine me, to sanctify me. It hasn’t been a painless process, but it’s gotten easier as time goes on. When you start recognizing your own spiritual growth, it’s incredibly worth the discomfort to get there. Sometimes I wonder if Christian marriages implode because couples don’t let the Holy Spirit work in their hearts. When you’re too caught up in the world, you’ll see things as the world sees them. Instead of graciously forgiving your spouse for accidental sins, you start keep a list of all the ways he’s not perfect. Maybe there’s someone better suited for you? Maybe The One is still out there?? Um, NO. Don’t even set foot on that road. You guys chose each other and that means he’s The One. Stay in the Word and let God shape you into who He wants you to become. Ladies, give your guys a chance! You’re not in a movie and your husband isn’t a screenwriter (unless he is – and then, well, he better come up with some pretty love words every once in awhile!) He’s not always going to say the right thing. Guess what…you aren’t either. So, love your spouse for who they are – NOT who you think they should be. God didn’t create marriage so that all of our emotional needs would be met by our spouse. We’ve got to find our worth in Him first. #4 Learn each other’s love language. Jeremy and I will both be forever grateful that our Sunday morning Bible class studied The 5 Love Languages: The Secret to Love that Lasts awhile back. I firmly believe that was the turning point in our relationship. Our eyes were opened as we hit upon the realization that we spoke completely different love languages. I spoke (and wanted to receive) Words of Affirmation. And Jeremy showed love (and wanted to receive it) via Acts of Service. That meant I was giving him vocal pats on the back when he really wished I would simply unload the dishwasher. And he was vacuuming the living room when I really wished he would look me in the eye and brag on my cooking. It’s been a journey to learn each other’s love languages, and we’re still not perfect at it, but it’s been completely helpful for us to realize that we could connect a lot easier if we tweaked our approach. In fact, I was writing this blog post earlier today and then made a decision to stop and straighten up the living room. I had been designing fall wreaths recently and had made a HUGE mess. Seriously, leaves and styrofoam and tiny pieces of moss everywhere. I knew it would speak love to him if I cleaned it up. #6 Tackle big projects together. We’ve built a container garden, a huge farm table, and a hall tree. We’ve gone on multiple mission trips to Nicaragua. We’ve had many, many discussions about how to talk to our friends or family about the Bible. Lately, we’ve been learning how to paint with oils. This year we’re coaching a Bible Bowl team at church. Each of these things pulls us together So Much More than sitting and watching TV. We should probably watch TV even less and do even more of those things! We like watching our Fixer Upper, but life should be much more than watching all the exciting things that other people do. Get out there and do some exciting things yourself! 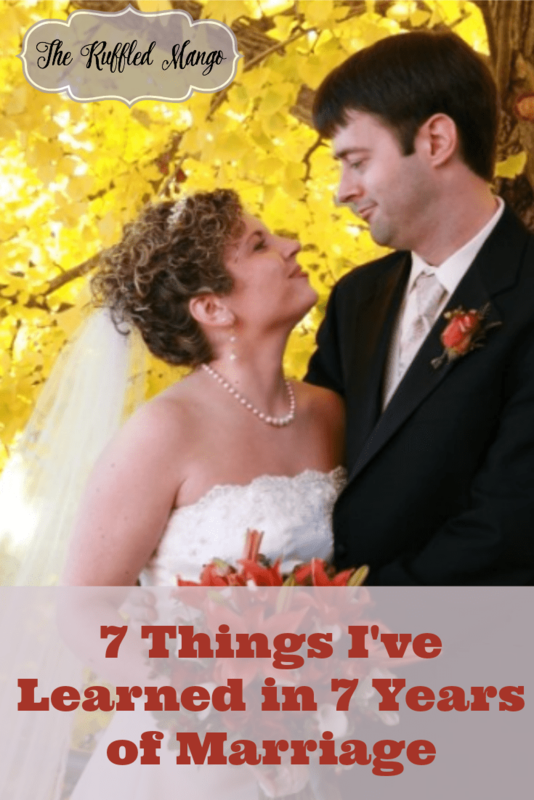 #7 Remember that marriage is just a small part of the bigger picture. While my brain knew that eternity will be infinitely longer than we’re here on earth, I wasn’t really living like I knew that. In the early years of our marriage, I let the temperature of our relationship determine my mood each day. But slowly, as we accomplished all of the above, we simultaneously grew in spiritual ways also. I noticed that when we “seek first the kingdom of God” – together and separately – each of us is happier in general. *These are affiliate links to books I own and reread often. They’re my absolute favorite marriage books. If you purchase anything through those links, I’ll receive a small commission at no extra cost to you. This helps keep The Ruffled Mango running smoothly! Much thanks, mango friends!